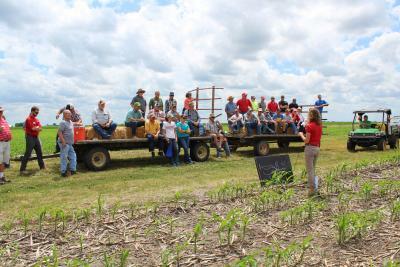 Farmers, ag retailers, and certified crop advisers gathered at the Southeast Research and Demonstration Farm on June 22 for the research farm association’s annual spring field day. Myron Rees, farm superintendent, kicked off the field day by sharing a farm and crop update with everyone. Some interesting research projects at the farm this year include roller-crimping cereal rye in organic soybeans, miscanthus, and a potassium timing trial. A quick weather update illustrated how dry it is at the farm. The 30-year average rainfall at the farm for the month of June is 5 inches and this year they only received 0.25 inches prior to the field day! 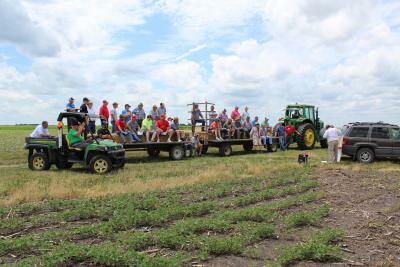 This year the field day featured three topics: dicamba drift and contamination injury on soybeans, managing seedling diseases in corn, and monarchs and pollinators on the farm. The first stop on the tour took a closer look at dicamba drift and contamination injury on soybeans. 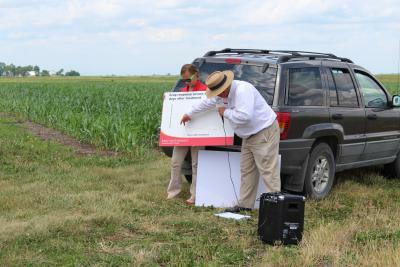 ISU Extension field agronomist Virgil Schmitt led the discussion at this stop. The stop highlighted how sensitive non-dicamba tolerant soybeans are to dicamba and emphasized how important it is to follow the label on how to apply and sprayer cleanout. Additionally just because you see leaf distortion does not mean that the damage is automatically caused by a Group 4 herbicide (dicamba, 2,4-D, Stinger, Mileston, Tordon) as Group 15 herbicides (Dual, Outlook, Zidua, Warrant, etc.) and environmental conditions can cause leaf distortion that mimics the Group 4 herbicide injury as this was observed in the plots the group look at. If leaf distortion of soybeans is observed, it is important to look at all of the evidence before assessing blame. 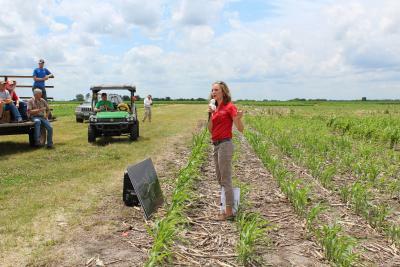 At the next stop, Extension field agronomist, Rebecca Vittetoe discussed managing seedling diseases in corn, particularly seedling diseases caused by Pythium spp, and what work ISU is doing to take a closer look at how different crop residues, planting dates, and seed treatments effect the presence of seedling diseases in corn. 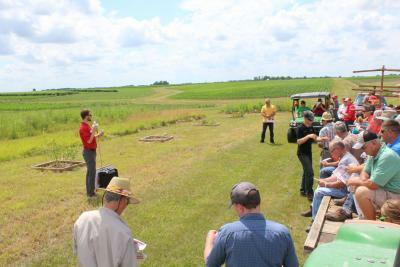 The final stop of the field day took a closer look at the unlikely relationships of monarch and pollinators on the farm. 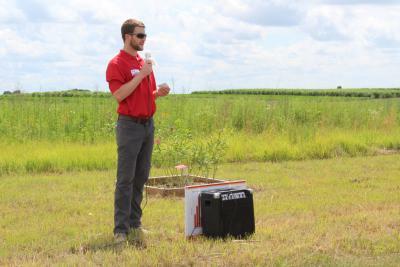 Seth Applegate, agricultural specialist with the Monarch Consortium at ISU, shared ideas on how farmers can implemented monarch and pollinator habitats on their farms. Learn more about the Iowa Monarch Conservation Consortium here and check out the handout that was shared with attendees that discussed how to include monarch and pollinator habitats and a suggested seed mix. Thanks to everyone who came out to the field day and for all those who helped make it possible!